Based on Epsom Downs, opposite Tattenham Corner railway station, Joe's Repair Shop offers all aspects of servicing, diagnostics, repair, MOT and body work for all makes and are a reliable and cost effective alternative to a dealership. They offer a free collection and delivery service and all technicians are fully trained and qualified in all aspects of servicing and repair. Owner Joe Pugh has 23 years experience and is a Saab Master Technician. Joe says " ... not only do I love the product. It's been part of my life for 23 years". 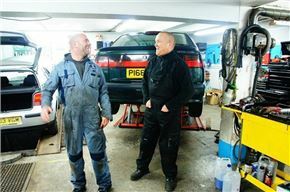 "A reliable and friendly garage with an honest team"
Joe and his team have looked after my Saab for a number of years. Their servicing is first class and my clutch change was completed as promised when it needed changing. The team will always try and meet my needs and I think they are wonderful! Polite, friendly, professional and reasonably priced. What's not to like? "Friendly, super helpful, great customer service." All my (many) queries were sorted with a solution to all! Parts ordered in front of me and costs up front, car booked in and looking forward to getting it fully back to health. Also provided me with travel advice to collect car by train, exceeded all expectation, would definitely recommend. Knowledge, expertise, contacts and service. "Excellent , polite and cost effective service"
Great service - first time used. Sorted the fault and retested to make absolutely sure it didn't come back. Accommodated me at short notice and kept me informed. Good quality personal service from knowledgeable people. Personal service levels and speed of response. Had a service done on my car and MOT. Can only highly recommend as previously. Very friendly, very knowledgeable at a very reasonable cost. Give them a try, you will not be disappointed ! "Absolutely Fantastic on Price and care"
Joe and Darren are both extremely knowledgeable, professional and always seem to go above and beyond. I cannot fault them. To be most treasured is their unfailing honesty in all situations. Between us, my husband and I have served up some stinkers in the way of cars and repairs required and difficult situations. Michelle at reception is always kind, courteous and helpful. Joe's repair shop rocks! "Best knowledge, however failing customer service"
Joe is the most knowledgeable mechanic I ever dealt with. I used him for years. He was the reason why I was confident to keep my Saab, despite the falling GM quality standards. However for some reason is become impossible to reach him. I'm literally begging for a quote to replace my steering rack for about 4 months. Number of calls, messages personal visit and still no luck. I even asked if I accidentally insulted them with something. Unfortunately I don't trust any other mechanic so very likely will replace my beloved Saab. As I said he is the best mechanic, however only 3 star due to the fallen standard of costumer service. Very disappointed. "Brilliant helpful and honest "
I moved to Epsom Downs and purchased a Saab, unknowing that there was Joe's repair workshop specialising in Saab's just down the road from me and stumbled across him by shear coincidence. Joe and his team have worked on my Saab and most recently on my Ford Van. I have found him to be most competent, approachable and enthusiastic at finding the problem, with a wealth of knowledge behind him. His wife Michelle has great communication skills keeping me informed of progress all the way from booking in my vehicle, to collecting it. I have spoken to various members of his mechanics team who have all portrayed level of professionalism and have been most courteous. In summary I believe it is hard these days to put your trust in garages, however have no hesitation in recommending "Honest Joe!". Its almost a pleasure to part with the vehicle repair charge as not only have I found them to be reasonably priced, one most certainly does NOT come away with the feeling of being ripped off! Nice one Joe, Michelle and team, keep up the standards that others should follow. PS one last mention, even their Dog comes out from behind the reception to say hello to me now! "Great service from a Saab expert"
Joe is the real deal when it comes to diagnosing Saabs. My 9-5 Aero Estate hasn't really boosted properly since I've owned it (2 years). I've lived with it as it's otherwise been very reliable and is only used as a business workhorse to take me to and from client visits etc. It got to the stage where I was fed up of not having the full 250bhp that I should have, so after to speaking with a number of Saab experts, I settled on Joe's Repair shop to diagnose and rectify the fault. I was fearing the worst, but Joe identified the problem, which involved freeing up the APC valve and the wastegate. This didn't completely rectify the problem, so Joe then fitted a new APC valve, which did rectify the issue. He only charged me for the cost of the part on the 2nd visit and fitted it free of charge, which he didn't have to do. I now have all horses back under the bonnet and wouldn't hesitate to recommend Joe's Repair Shop to anyone else, whether you have a Saab or not. It's not often you meet a genuinely good guy, supported by a friendly team, who is an expert in his field and puts the customer first. Joe is looking after my Saab for a number of years now. At this occasion I booked an appointment for diagnostic, as every time I accelerated air leak noise was coming from the engine bay. Diagnosed the damaged flexi exhaust pipe as the fault within 15-20 minutes. Although I should’ve book an another appointment for the repair, luckily Joe had a spare part in stock and was able change the part immediately, saving me the return trip for a second appointment. Absolute fantastic! While I was waiting for my car I was offered refreshment and had a nice chat with Michelle so time was flying. Many thanks. Highly recommended professionals! Fitted me in at short notice as brakes had gone. Charged as quoted and kept informed throughout. Car was ready on time as promised. No hesitation in recommending this garage. "Friendly professional service, honest advice, good value for money"
Joe repaired my OG Saab 9-3 Aero's gearbox. Replaced reverse gear and syncro ring and replaced a number of bearings. Gearbox feels like new and will give me many more miles out of my car. Really knowledgeable guy, a pro on Saabs. "Fast, honest and friendly repair shop!" Went in to have my parking sensors installed. They managed to fit me in and complete the job fast and cheap! Very accurate reviews for these guys! So we are about to go and collect a daughter and Grandson who are flying into Heathrow. Our trusty Saab 93 has never let us down, but this time was different - the afternoon before the collection the ignition key disintegrated - literally - and the spare which had been in the drawer for 15 years? Dead. However a friend suggested trying Joe who he thought was a Saab specialist. Thank God I did. Although in the middle of another job Joe immediately offered to supply two keys and reprogram them into the ECU. This was outstanding because a) he could supply keys off the shelf, b) there was no "well, I could do it tomorrow" or suchlike. I really couldn't believe I had struck so lucky. And it all happened just like Joe said it would, the keys worked, the daughter and grandson were collected. All I can say is thank you Joe and team and highly recommend Joe's Repair Shop. "Excellent, supremely competent, superb customer service"
"Always a pleasure to use this garage; they take great pride in all that they do. " Great customer relations; competent work and they only do the work which is necessary; no surprises and all at a reasonable price. "First Class Service From A First Class Team!" Joe`s Repair Shop is the ONLY place to go if you want a First Class Service for your SAAB! Forget all the others,Joe loves SAAB & is not only a fully trained SAAB Tecnician but a proper smashing bloke too! Along with his lovely Wife Michelle & their Top Team they always pull out all the stops to get you back on the road Super fast! I took my SAAB in for an MOT & service but did need some other work doing & was more than pleased when Joe & the gang got me in & out in one day!A truly professional service along with fair pricing makes Joe`s Repair Shop number one every time! Give them a go,you will not regret it,just tell them Viv (the Spiv) told you! Joe and his team did an amazing job on my 93 2.8 V6 XWD and with the customer satisfaction in mind Joe made sure we had the best outcome for the issue my car had. Joe good out of his way to make it all happen. "Customer friendly and no problem is too small for this garage." Once again Joe and his team have quickly diagnosed the problem,fixed it quickly and economically. A friendly garage and a pleasure to visit. I have no hesitation in recommending this team. They are knowledgeable, friendly and customer centered. The work was completed at short notice, ahead of schedule and below the initially-quoted price. Keep up the good work! "Excellent and very friendly service, great prices"
"Everthing you need from a garage"
"Professional, knowledgeable, friendly, honest, reliable, great service and great value." I've never felt like I love a garage repair place before - but I love this one! It's great and Joe is a wonderful find. I would recommend him to anyone.
" Professional in every way! Great service and trustworthy." The entire team at Joe's is first rate, overall the best customer service and work I have ever received from an auto dealership or repair shop, extremely knowledgeable, especially with Saab's, The technician accurately diagnosed and fixed my problem first time, the staff kept me updated on delays and discussed my options, these people know their stuff! The overall experience was great and professional. I was very satisfied with the costs regards the work involved and the timing and the friendly atmosphere, I will continue to go there for all my service needs in the foreseeable future, I have already recommended them to fellow Saab owners! I've used these guys for various bits on my classic 900 now, including a strange intermittent issue with the brakes which Joe diagnosed almost immediately. I've not come across anyone who know Saabs better than Joe. He is totally trustworthy and always does a great job. Plus they are very friendly and always make time for you. He has a good knowledge and contacts for sourcing spare parts. Great value - definitely a safe pair of hands. Highly recommended. Major service for my SAAB 95. All done to time but oil leak identified from gearbox (hot oily smell reported). Returned for what was estimated to be around £800 for gearbox out (seals maybe) and new clutch etc while the box was out. Up on the ramp - oil leak not where expected - several bolts tightened - pressure washed and run on ramp for an hour. No leak visible. Plan - take it home - run it around - come back and let us have a look. Brilliant thanks - how much? Er nothing. Little short of amazing. Went home pinching myself. "The best thing you can do for your Saab....take it here!!" I've worked in sales in the motor trade for almost 25 years and don't usually 'do' reviews, however in this case I've made an exception. If you want friendly, honest and straightforward no nonsense advice combined with excellent service this is the place to come, all of my Saab work goes here without question(they do carry out work on all makes by the way!!) and all of my Saab customers are recommended to use Joe and his team for their future servicing/repair needs. Entrusting my own customers' future satisfaction to Joe is the best recommendation I can give but don't take my word for it, book your car in and find out for yourselves!!!! If your looking for an honest Saab mechanic you've found it. If your looking for flash premises and high bills your looking in the wrong place. Just wish he was nearer to my home. "Strongly Reccomend, unlike any other garage I have come across. " I left my car at Joes on a sunday night, ready for him to look at on the Monday. Monday lunch time I recieved a call, expecting to hear the disgnosis, yet the car had already been fixed and was ready to pick up, also at a reasonable cost. Cannot reccomend enough. ""Brilliant & First Class Service all round from Start to Finish!"" Since SAAB service ceased to exist i had struggled to find a decent Garage to look after & Love my Beautiful SAAB as much as i do & in Joe`s Repair Shop (Surrey SAAB Specialists) Epsom Downs I found just that! not only is Joe a fully Trained SAAB Technician he loves SAAB as much as me! Along with his Lovely Wife Michelle & his Top Class team i know that my Lovely SAAB is being loved again & is safe in their hands! along with 5 star service & fair pricing i can recommend Joe to anyone & have & they also are pleased with the wonderful service they also have recieved.Keep up the great work Joe & Co,We would be lost & unloved without you all! Cheers! Viv the Spiv. Wow, this garage is both Faultless and Fabulous! Open from 7.30am with a welcoming smile and mannor, All repairs done quickly and efficiently and at a good and fair price. One of the guys even waited behind so that i could collect my car as i was running a little late after finishing work. Also fabulous service and staff in all area's! Will be coming back again and bring all my family and friends! "Honest, friendly and all round fantastic garage." I reviewed Joe's fantastic skills last year when he saved my Saab. Since then he's serviced it twice and replaced the dreaded dead amp. When I saw he'd opened his repair shop I was a bit anxious-would he be as good? Would he be as honest? Would he be as friendly? Truthfully? It's even better. Not only do you have Joe's expert, honest and friendly service, you also have Darren, his co-worker. In addition you also have Joe's lovely, helpful wife, Michelle. Nothing is beyond them. I won't ever go elsewhere, and recommend them to everyone in need of a mechanic. This wasn`t the first time I used Joe`s expertise. My 2002 Saab 93 was loosing coolant every now and then for a very long time. It started to bothering me so much I took it to Joe. He advised it could be water pump. As he wanted to make sure that's the problem before he start replacing parts I left the car with him for a couple of days so the car can show the symptoms. Once he was confident this is the problem he replaced the requested parts and so far so good. He only using genuine or very high quality aftermarket parts from the most trusted manufacturers. He also explains why the faults occurred on the first place and what jobs he carries out. As I mentioned earlier it wasn't the first time and definitely not the last. Thanks Joe! Highly recommended! This is the fourth time I have used Joe's services. He has once again performed his magic, the car has come back running like New. I won't hesitate to use his garage again. "a car sage and he knows his onions as well"
I had a rare and recurring issue with my Saab 9-5 engine, and there are no Saab specialists anywhere near Hackney. My local boys could only reset the diagnostics, but not solve the problem. I took it to Joe after reading great reviews, he's super-knowledgeable and began trouble-shooting, trying a few things over a number of visits which helped. He went out of his way to get in touch months later when he'd solved the mystery. When I first met him he was operating from home and juggling cars around his drive-way, now he's running a really impressive garage with his mate. I dropped the car back, he donned a stethoscope and began carefully probing around the engine, using the sound he found a leak in the intercooler. Now that's what I call persistence, he sourced quality parts and fixed it while I waited, throwing in a brew, a bit of advice and some windscreen fluid for free. A very happy customer indeed, it seems I'm not the only one, "Joe's" is now really busy and it's great to see his success. Highly recommended! "Dependable, Honest, Friendly and trustworthy - Won't go anywhere else... ever!" Joe helped me out of a pickle at short notice, after I tried (and failed) to fix the roof of my Saab 9-3 convertible myself. I found his garage via this website and will gladly come back for any future repairs/services. He is genuine, friendly, knows his stuff and charges very reasonable rates. Great guy and I recommend him to anyone, Saab driver or otherwise! "outstanding value for an expert mechanic"
I used joe 's repair shop because he is passionate about mechanics .........I don't own a saab but this made no difference to joe ..he happily took on my Renault kangoo van an old van that looks a bit tatty; repaired the obvious faults that we knew about (rear brakes) first and after failing the MOT contacted me with an estimate for the repair bill and availability. A great guy who has done a great job .....Thanks To Joe and Michelle for expert service at a great price!! "Great service and advice-best Saab specialist in the Southeast"
I called in and Joe diagnosed my Saab and fixed it on the spot-something that had been misdiagnosed by my usual repair shop. It turned out to be a £75 job rather than £1,000. Great guy, great advice about my car in general! "Superb diagnostic skills and service for my Honda"
I used the services of Joe for the first time a couple of days ago and am really pleased with the work he has done on my wife's Honda Civic and also his genuine, friendly approach to customer service. The Civic has suffered from a variety of clunking noises over the past few years and recently developed a grinding/rubbing noise when turning left. Joe picked up the car and quickly diagnosed the components that were causing the issues. He explained in detail what needed to be done and on my instructions, proceeded to replace the worn parts (lower wishbone, Wheel bearing, 2 x anti-roll bar links). When he returned the car, he took the time to show me the work undertaken. The proof of the pudding came when I drove the car - the handling and feel of it were totally transformed. Based on my first experience with Joe, I intend to use his services for both our cars for the forseeable future, and....... ..... he is a really nice guy! Great service both for me and my car. Joe is a great chap, good value and all a garage should be. "Genuine and honest Saab expert"
As all of us experience with garages it’s really hard to find honest reliable mechanic with good knowledge and reasonable price. But try out Joe’s Repair shop. I found Joe’s repair shop via this website and booked in my Saab 93 for major service and some other few fixing - all work done to a high standard and very reasonable cost. Joe is genuine, honest, reliable, expertise, polite and reasonable charge. I can't recommend him highly enough. "Carlsberg dont do garages but if they did............."
"Tremendous service, help, kindness and expertise"
I brought my Saab Aero in with a constant cooling issue and the car using an astronomical amount of fluid. Joe not only diagnosed the problem of a hole in the radiator but fixed and fitted a replacement in a day, repaired the hood as well as the bumper for a very reasonable fee. He is a great asset to anyone with a Saab and has a tremendously positive manner as well a wealth of experience. I could not endorse his services highly enough and would recommend him as well as colleagues to anyone. A marvellous experience. "Excellent service at a very competitive rate"
Top gezzer , just got his own garage site up and running in Tattenham Corner due to demand . I've been running old Saabs and doing my own work for 25 years ,saying that, he is very reasonably priced and will without doubt use him again for those jobs that are getting to complex for me to sort out as he is totally honest and trust worthy . "Very helpful easy to get on with"
Excellent service from Joe at SSS. Extremely helpful and sorted out my xenon headlamps on my Saab 95 and fitted an alarm module at a very reasonable price!! 1st class service, can't recommend SSS enough! One extremely happy customer! Thanks Joe! "Good, honest garage and guy"
I had a problem with my car alarm going off. Joe couldn't have been more helpful and managed to sort it the same day. Great service. "A Godsend - simply brilliant." Having recently acquired a 51 Reg 93 Convertible, I had no idea what to do when dashboard lights suddenly went on and it went into, what I now know is called, 'limp home mode'. This all happened on Monday. In a panic I googled for a Saab specialist and fell upon this website with excellent reviews. I took the plunge and was not disappointed. When I rang Joe on Tuesday he arranged to come out as soon as he could (same afternoon). He diagnosed the problem and ordered the part - a sensor (from Sweden), he then very kindly, 'limped' my car back to his garage. As agreed, I had my car back in time for the weekend, purring happily. The cost was extremely reasonable for the trouble Joe went to, and I am almost glad that the sensor went, as I now know who to turn to for my car's servicing next year and any other needs she may have over the years. Although Joe clearly loves Saabs, he knows a lot about other makes too, so I'll be encouraging my husband to use the garage for his Volvo. Excellent, good-humoured and thoughtful service. I can't recommend Joe and his garage enough. "Great find via Honest John"
"Outstanding - friendly, knowledgable, helpful, good old-fashioned (and rare) great customer service!" Joe is clearly a Saab fan (the number of them outside his house attests to this!) and knows his stuff. Having bought my 55 plate 9-3 in July, he gave it a quick once over at no cost and confirmed that I had gotten myself a great car by the looks of things. I booked a service (very reasonable) a couple of months later, and not only did Joe come and collect/drop off the car, he fixed the sticking window at no cost, and lent me his ratchet straps so I could tie my old MGB to the trailer I hired for transporting it round to my garage from where it had been laid up for a few years at my folks place. Thoroughly decent bloke, recommended for all things Saab and more!!! I will be using him for all my car servicing/repair needs in the future for sure. "Excellent and very very rare..."
Thank goodness for this website and reviews. I met Joe Pugh as my Saab Aero has had an engine warning light prevalent for five years. I had been told that it was only a sensor issue but nobody could locate a sensor and there was a two month delay in obtaining one. Thankfully Joe found one in twenty four hours, repaired a few other aspects and the car is running like a dream. he drove out to Teddington, collected the car, repaired the faults and returned the Saab in fully operational order. i can not recommend him highly enough. A thoroughly likeable and friendly man, he is every poorly car's dream. You will not be disappointed if you use his services. "Joe Pugh is a knowledgeable and decent honest mechanic." I found Joe through this website and took my 93 Saab 2.2 diesel to have warning lights which had caused the car to go into limp mode investigated. He diagnosed the problem, fixed it in a few days and for a decent and fair price. As all the other reviewers will testify, to coin a catch phrase "Does exactly as it says on the tin". "Words can't describe how good Joe is-excellent doesn't come near." My beloved Saab 9.3 convertible suffered seized water coolant and shredded timing belt. (I think that's right, but I was in mourning!) The RAC man had said it was probably terminal-it would need an engine transplant. Because I love my car I thought I'd try to see if anyone could resuscitate it, but didn't hold out much hope. I know nothing about cars, so was ready for a lot of patronising and being ripped off, going from past experiences (including main Saab dealer). Found this garage on this site. JOE PUGH is a genius. He fixed it. Not only that, it cost about half of what the RAC man had estimated. He kept me informed all the way through and I can't recommend him highly enough. He explained what future work I may need, and didn't patronise me or make me feel stupid because I don't know about engines. He really knows his stuff, and I have told almost everyone i know about him-he fixes all cars, not just Saab. Five stars just aren't enough. He is a lovely man too. "They don't make people like Joe any more. Excellent service and undeniable expertise"
Faullt had flumoxed the local garages, but Joe diagnosed the cause almost straight away. Prior to that I had been advised to replace the DIC then the Air Mass Meter, in the end it was the throttle body. New part ordered and fitted in a 24 hour turnaround. Astoundingly good service, incredibly knowledegable on everything related to SAAB. Wouldn't hesitate to recommend Joe most highly. Excellent and caring service with very fair rates. "Awesome service, everything a garage should be. Surrey Saab Specialists have redeemed the auto repair profession!" I was given this garage contacts by a collegue to rectify a problem with my Saab 93 2.8 Turbo XWD. I had previously taken the car to the franchise where I bought the car, and had no luck fixing the XWD back wheels scuffing, "said I had a wheel out of balance and was putting the axle out !" wanted to charge £280 to fit a Continental tyre, when all the others were Pirelli P Zero nero. When I contacted Joe, he was all up for the task, took 3 days, he fixed the car and at a fraction of the cost it could have been. I had nightly updates, telling me about the car, he even dropped and collected me to and from Epsom rail station. I came all the way from Sevenoaks, and glad I did. Joe has won my custom, Whitmores Chislehurst has lost my custom. To put it in perpective, Joe fixed my car for £14 more than Whitmores wanted to charge for my tyre being out of round and has been proved wouldn't have fixed the car. I would totally recommend Surrey Saab Specialist ! "Fantastic service! Wouldn't hesitate to recommend!" "The best mechanic I've ever come across, friendly, insightful, knowledgeable, professional and great value "
Joe worked late on 2 occasions to help me out of a pickle, the convertible roof wasn't closing correctly and he took me trough the steps to right it without having to spend any money. He also figured out an air leak problem that affected the driving of the car for a very reasonable rate. I went to him due to the comments online and I have been blown away by his service (as a female I always feel like I'm gonna be shafted at a garage!!) and professionalism. He is extremely passionate about SAAB's and it really shows in his work - you feel like your car is in the best hands possible... I can't recommend him highly enough - I traveled almost 40 miles to get to him and I won't go anywhere else, my partner will also take his BMW to him in the future too. Thanks Joe - you are a superstar!!! "All the things you want in a mechanic but rarely find - knowledgeable, helpful, friendly & honest"
Found Joe on this sight and after reading the reviews I decided to trust it and have him a call - am so glad I did. I was looking for someone to MOT our Saab 9-5 and repair the ABS after a previous garage had failed to diagnose the problem. When I spoke to Joe he obviously knew his stuff and he not only diagnosed the problem but got the part, fitted it and MOTd it for us - and by the following morning it was ready to collect. Will definately be using him again and would recommend anyone who has a Saab to give Joe a try. "Great expertise, excellent service and good value"
Was able to diagnose the root problem based on experience with SAABs and fixed it at economic price and with a quick turnaround. Having tried two garages who failed to sort the problem on my car, (one of whom was a so called Saab specialist), I was glad to find Joe who diagnosed and rectified the problem promptly. He provided a good and honest service and on that basis I would definitely use him again. An amenable and trustworthy chap. Dan Thornton. "I'd trust him with my car"
"Friendly, helpful and an exellent knowledge Saab." We took our recently purchased 2002 9-5 aero (our 4th Saab) to Joe after seeing the recommendations on this site. Having just bought the car we wanted to get it checked over and a few niggly bits looked at. Joe carried out a thorough inspection & reported any issues, carrying out a sump service & auto fluid change at our request & replaced leaking rear shocks at a very reasonable cost. She's driving much better now. Further work to be done in the near future & will definately be going back to Joe. Its good to meet a straight talking, honest mechanic who has an exellent knowledge of saabs of all ages. Mark & Vanessa. Farnham Surrey. Joe Pugh (AKA Surrey Saab Specialist) recently undertook an annual service and additional repairs upon my 2002 Saab 9-3 2.2 TDI hatchback. The quality of service provided by Joe was excellent and I highly recommend him to those seeking a realistically priced alternative to the "main dealer" network. His rates are reasonable and his knowledge of the Saab marque extensive. I will certainly be using his services again. Contacted Joe when the front brakes on my 900s began binding again. Joe picked up the car that evening and had it back to me the following afternoon. He also sorted a couple of other issues at the same time and I'll definitely be using him again to fix some more minor problems! "Very impressive - will be using Joe again"
My front brakes on my 9-5 Aero needed attention. Spoke with Joe and he swapped the pads and the discs in no time at all - very happy customer here. I need MOT and service in March and will be calling Joe again. Joe is very knowledgeable , tells it like it is . I will definitely be using him again.. My SAAB 9-3 running like a dream . My Saab 93 (2006) was due its MOT and coincidentally devoped a gearbox problem. The garage I'd used before had just gone into administration. So I found Joe via this website and was very pleased I did. He was able to repair the gearbox efficiently and without fuss and then arranged for a new MOT. Excellent value for money. I needed Joe's help about a week ago. I have got a Saab 9-3 1.9 TiD Vector and had some frightening problem with the EGR valve (blocked). I found him on the internet and phoned. He visited me soon, examined the car and the next day I got it back like a brand new one. It runs brilliant. And last but not least it wasn't very expensive. It worth the money. I would feel free to recommend him to everyone, real expert. I recently bought a late 2009 VW Tiguan, shortly afterwards problems started with Diesel Particle Filter. Recommended by a friend who had the same issue with a VW Golf I took it to Joe. The service I received was excellent and will be using Surrey Saab Specialists for any other work. I would thoroughly recommend them. "Fast, reliable and value for money"
Contacted Joe from the web and booked my 9-5 estate in which had an annoying clonk when going over bumps. As I had recently bought the car I asked Joe to give the car the once overas well while it was with him. This could have been an opportunity to fix all manner of problems that may not have existed but Joe sorted the Clonk (front drop links) and declared the car a goodun and no further work required. Great service. I will certainly be back. Highly reccommended. "Extremely knowledgeable, friendly and flexible." I bought a very cheap 2000 plate Saab 93 diesel recently with 198,000 miles on the clock, and not surprisingly it needed a lot of TLC. I found Joe through this website and phoned him. He came over that evening and took the car back to his workshop. He has the Saab diagnostic instruments so was able to find and fix the many and various faults. He also has a great contact for refurbishing electronic instrumentation such as the SID unit in the dashboard which had stopped working in my car (it's now perfect!). Joe returned the car this evening and it drives like a brand new car - this bloke's a genius and a genuine enthusiast too, plus his prices are very reasonable. I will be sending my car to Joe for all future servicing and repairs. I can't recommend him highly enough!! Immensely knowledgable and very friendly. I would recommend this firm to anyone. "truly excellent (personal) service from knowledgable guy "
It's a great comfort to know the person who's working on your vehicle and Joe is both experienced and trustworthy - and not only on Saab. He looks after my Audi and a Golf for a member of my family. He has all the diagnostic kit for VAG, charges reasonable rates and is thoroughly reliable. "Competent, very good value, straightforward, honest"
I found Joe,s garage from the internet and gave him a call cos my saab was due belt change and full service!He did a package deal for me which was far more better than any other offers that i recieved!! !For a long time i haven,t got such a nice service from any other garages in the area where i live as him!He is a person who gives you friedly and totally reliable service with non cost effective bonus in the end!!! "Excellent service, cost effective, hard facts, no bullsh#t"
Good, cost effective, swift and "spin-free" service. Accurate diagnosis followed up by timely fixing at a reasonable cost. "Joe Pugh Saab specialist located in Epsom, offers a professional and efficient service, at a very competitive price."